Ten Ten Mass is contemporary condominium located at 1010 Massachusetts Avenue, NW, in Washington, DC’s Mount Vernon area. 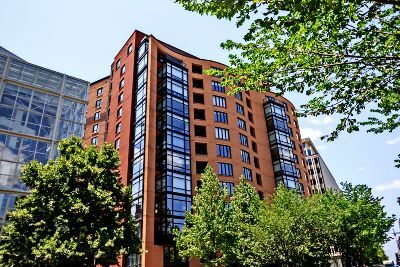 Delivered in 2007, the stylish 14-story building is home to 163 luxury condo residences, making it one of the larger developments in the Downtown DC area. That said, it’s not nearly as big as the next-door Residences at CityCenter which boasts 216 condos, 458 apartment rentals and scads of office space. Condos for sale at Ten Ten Mass come in a number of intriguing configurations, with floorplans ranging from 700 to 1,404 square feet in size. With light-colored hardwood floors, soaring ceilings and genuine floor-to-ceiling windows, these modern residences utilize the great room concept with living space at one with the cooking/eating area. The sublime kitchens sport maple cabinets, granite counters, pendant lighting and GE Profile stainless steel appliances. Some units come with private outdoor terraces, and the giant three-sided glass window bays also offer a feeling of stepping out into the city beyond. Also worth noting are the spa travertine baths with elongated vanities and vessel sinks. Condos for sale at Ten Ten Mass have recently been listing between $329,000 and $1.875 million. This full-service pet-friendly building also features a 24/7 staffed front lobby, secure garage parking, extra storage, a rooftop swimming pool and accompanying deck with gas grills, dining areas, seating and amazing views. But the location is also a huge attraction, with countless bars restaurants, shopping and entertainment nearby. With Chinatown, the Verizon Center, multiple Metro stations, museums, theaters, a Whole Foods and so much more all within easy strolling distance, Ten Ten Mass is right in the heart of the city. To learn more, call District Partners Real Estate, LLC, at 202-798-3600.